Your technix combined threaded audi a4 8k2 8k5 front sedan a5 coupe cabrio 8t 8f. This product page has been automatically translated. If you have any questions, do not hesitate to contact us. Your technix coilovers audi a4 8k 2k 8 5 sedan front a5 coupe cabriolet 8t 8f. The continuous height adjustment of the coilovers, the vehicle can be conveniently adjusted in appearance and driving dynamics to the own claims against a sports suspension with fixed lowering. Pure driving pleasure - a must for all sports drivers with high demands. 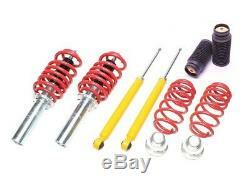 Specially adapted to your vehicle coilover. Sporty driving with comfort thanks to high quality gas springs. About 30% more difficult driving characteristics compared to the standard suspension. Less ambitious inclination driving in the curves. Improved road and improved appearance by lower center of gravity. Quality components for long service life: galvanized spacer housings, powdercoated springs. Continuously adjustable in height on front and rear axles, even after installation. To display purposes would also decrease up to 100 mm possible without legal street! Proven branded product with excellent value for money. With the certification under Article 19.3 for a smooth eintragung (geprüfter bereich technische details). Please refer to the technical details, especially the maximum allowable specified axle loads.